Join Rick Sammon for a mini-course on landscape photography while uncovering the magic of Utah’s state and national parks. Rick takes you on a road trip that starts in Salt Lake City, Utah and ends in Las Vegas, Nevada, while showing you an array of amazing places to photograph along the way. You’ll be introduced to places like Bryce Canyon, Goblin Valley State Park, Zion National Park, Arches National Park, Dead Horse Point State Park, and so many more! At each scenic location Rick shares his tips, tricks, techniques to help you get the most out of your gear, your photography, and your time. 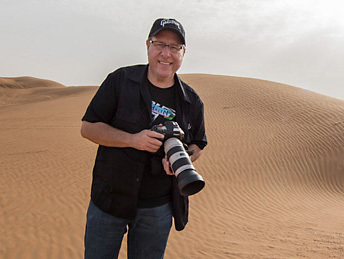 With Rick, you’re sure to have a ton of fun and by the end of the class you’ll be ready to plan your next trip to photograph all that Utah has to offer. Join Rick Sammon and learn how to get the most out of photographing Yellowstone and Grand Teton National Parks. These parks are close together, and a must-see destination for landscape and wildlife photographers. In this class Rick shares his favorite locations within both parks, and teaches you how to prepare for your trip, tips for creating powerful compositions, overcoming exposure challenges, how to shoot time-lapse and HDR, and a host of tips, tricks and techniques for landscape and wildlife photography. OK, guys — today, Cyber Monday, is your last chance to get our absolute best prices of the year on KelbyOne Pro annual memberships, and Photoshop World 2019 Conference Tickets (your choice: Orlando in late May or Vegas in August). Today, starting at 10:00 am ET and running until 5:00 pm, at the top of every hour we’re doing LIVE 10-minute screaming deal Webcast where we convinced one of our partners to offer an insane discount but just for One-hour (and ONLY1-hour) but you’ve got to watch to get the Discount code. When: Today starting at 10:00 am and at the top of every hour until 5pm ET. OK, that’s the Cyber Monday scoop! The deals are here, but only for today!